"Black Tuesday" redirects here. For other uses, see Black Tuesday (disambiguation). For other uses, see Wall Street Crash (disambiguation). The Roaring Twenties, the decade that followed World War I that led to the crash, was a time of wealth and excess. Building on post-war optimism, rural Americans migrated to the cities in vast numbers throughout the decade with the hopes of finding a more prosperous life in the ever-growing expansion of America's industrial sector. While American cities prospered, the overproduction of agricultural produce created widespread financial despair among American farmers throughout the decade. This would later be blamed as one of the key factors that led to the 1929 stock market crash. Despite the dangers of speculation, it was widely believed that the stock market would continue to rise forever. On March 25, 1929, after the Federal Reserve warned of excessive speculation, a small crash occurred as investors started to sell stocks at a rapid pace, exposing the market's shaky foundation. Two days later, banker Charles E. Mitchell announced that his company, the National City Bank, would provide $25 million in credit to stop the market's slide. Mitchell's move brought a temporary halt to the financial crisis, and call money declined from 20 to 8 percent. However, the American economy showed ominous signs of trouble: steel production declined, construction was sluggish, automobile sales went down, and consumers were building up high debts because of easy credit. Despite all the economic trouble signs and the market breaks in March and May 1929, stocks resumed their advance in June and the gains continued almost unabated until early September 1929 (the Dow Jones average gained more than 20% between June and September). The market had been on a nine-year run that saw the Dow Jones Industrial Average increase in value tenfold, peaking at 381.17 on September 3, 1929. Shortly before the crash, economist Irving Fisher famously proclaimed, "Stock prices have reached what looks like a permanently high plateau." The optimism and the financial gains of the great bull market were shaken after a well-publicized early September prediction from financial expert Roger Babson that "a crash was coming". The initial September decline was thus called the "Babson Break" in the press. That was the start of the Great Crash, but until the severe phase of the crash in October, many investors regarded the September "Babson Break" as a "healthy correction" and buying opportunity. On September 20, the London Stock Exchange crashed when top British investor Clarence Hatry and many of his associates were jailed for fraud and forgery. The London crash greatly weakened the optimism of American investment in markets overseas. In the days leading up to the crash, the market was severely unstable. Periods of selling and high volumes were interspersed with brief periods of rising prices and recovery. Selling intensified in mid-October. On October 24 ("Black Thursday"), the market lost 11 percent of its value at the opening bell on very heavy trading. The huge volume meant that the report of prices on the ticker tape in brokerage offices around the nation was hours late and so investors had no idea what most stocks were actually trading for at the moment, increasing panic. Several leading Wall Street bankers met to find a solution to the panic and chaos on the trading floor. The meeting included Thomas W. Lamont, acting head of Morgan Bank; Albert Wiggin, head of the Chase National Bank; and Charles E. Mitchell, president of the National City Bank of New York. They chose Richard Whitney, vice president of the Exchange, to act on their behalf. With the bankers' financial resources behind him, Whitney placed a bid to purchase a large block of shares in U.S. Steel at a price well above the current market. As traders watched, Whitney then placed similar bids on other "blue chip" stocks. The tactic was similar to one that had ended the Panic of 1907. It succeeded in halting the slide. The Dow Jones Industrial Average recovered, closing with it down only 6.38 points for the day. The rally continued on Friday, October 25, and the half-day session on Saturday, October 26, but unlike 1907, the respite was only temporary. Over the weekend, the events were covered by the newspapers across the United States. On October 28, "Black Monday", more investors facing margin calls decided to get out of the market, and the slide continued with a record loss in the Dow for the day of 38.33 points, or 13%. On October 29, William C. Durant joined with members of the Rockefeller family and other financial giants to buy large quantities of stocks to demonstrate to the public their confidence in the market, but their efforts failed to stop the large decline in prices. The massive volume of stocks traded that day made the ticker continue to run until about 7:45 p.m. The market had lost over $30 billion in the space of two days, including $14 billion on October 29 alone. After a one-day recovery on October 30, when the Dow regained an additional 28.40 points, or 12 percent, to close at 258.47, the market continued to fall, arriving at an interim bottom on November 13, 1929, with the Dow closing at 198.60. The market then recovered for several months, starting on November 14, with the Dow gaining 18.59 points to close at 217.28, and reaching a secondary closing peak (bear market rally) of 294.07 on April 17, 1930. The following year, the Dow embarked on another, much longer, steady slide from April 1931 to July 8, 1932, when it closed at 41.22, its lowest level of the 20th century, concluding an 89 percent loss rate for all of the market's stocks. In 1932, the Pecora Commission was established by the U.S. Senate to study the causes of the crash. The following year, the U.S. Congress passed the Glass–Steagall Act mandating a separation between commercial banks, which take deposits and extend loans, and investment banks, which underwrite, issue, and distribute stocks, bonds, and other securities. 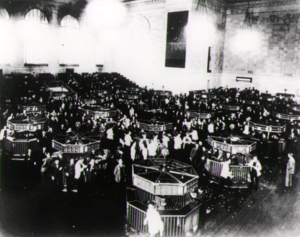 After the experience of the 1929 crash, stock markets around the world instituted measures to suspend trading in the event of rapid declines, claiming that the measures would prevent such panic sales. However, the one-day crash of Black Monday, October 19, 1987, when the Dow Jones Industrial Average fell 22.6%, was worse in percentage terms than any single day of the 1929 crash (although the combined 25% decline of October 28–29, 1929 was larger than that of October 19, 1987, and remains the worst two-day decline ever). The American mobilization for World War II at the end of 1941 moved approximately ten million people out of the civilian labor force and into the war. World War II had a dramatic effect on many parts of the economy, and may have hastened the end of the Great Depression in the United States. Government-financed capital spending accounted for only 5 percent of the annual U.S. investment in industrial capital in 1940; by 1943, the government accounted for 67 percent of U.S. capital investment. The crash followed a speculative boom that had taken hold in the late 1920s. During the latter half of the 1920s, steel production, building construction, retail turnover, automobiles registered, and even railway receipts advanced from record to record. The combined net profits of 536 manufacturing and trading companies showed an increase, in the first six months of 1929, of 36.6% over 1928, itself a record half-year. Iron and steel led the way with doubled gains. Such figures set up a crescendo of stock-exchange speculation that led hundreds of thousands of Americans to invest heavily in the stock market. A significant number of them were borrowing money to buy more stocks. By August 1929, brokers were routinely lending small investors more than two-thirds of the face value of the stocks they were buying. Over $8.5 billion was out on loan, more than the entire amount of currency circulating in the U.S. at the time. The rising share prices encouraged more people to invest, hoping the share prices would rise further. Speculation thus fueled further rises and created an economic bubble. Because of margin buying, investors stood to lose large sums of money if the market turned down—or even failed to advance quickly enough. The average P/E (price to earnings) ratio of S&P Composite stocks was 32.6 in September 1929, clearly above historical norms. According to economist John Kenneth Galbraith, this exuberance also resulted in a large number of people placing their savings and money in leverage investment products like Goldman Sachs' "Blue Ridge trust" and "Shenandoah trust". These too crashed in 1929, resulting in losses to banks of $475 billion 2010 dollars ($545.75 billion in 2018). Good harvests had built up a mass of 250 million bushels of wheat to be "carried over" when 1929 opened. By May there was also a winter-wheat crop of 560 million bushels ready for harvest in the Mississippi Valley. This oversupply caused a drop in wheat prices so heavy that the net incomes of the farming population from wheat were threatened with extinction. Stock markets are always sensitive to the future state of commodity markets, and the slump in Wall Street predicted for May by Sir George Paish arrived on time. In June 1929, the position was saved by a severe drought in the Dakotas and the Canadian West, plus unfavorable seed times in Argentina and eastern Australia. The oversupply would now be wanted to fill the big gaps in the 1929 world wheat production. From 97¢ per bushel in May, the price of wheat rose to $1.49 in July. When it was seen that at this figure American farmers would get rather more for their smaller crop than for that of 1928, stocks went up again. Other important economic barometers were also slowing or even falling by mid-1929, including car sales, house sales, and steel production. The falling commodity and industrial production may have dented even American self-confidence, and the stock market peaked on September 3 at 381.17 just after Labor Day, then started to falter after Roger Babson issued his prescient "market crash" forecast. By the end of September, the market was down 10% from the peak (the "Babson Break"). Selling intensified in early and mid October, with sharp down days punctuated by a few up days. Panic selling on huge volume started the week of October 21 and intensified and culminated on October 24, the 28th, and especially the 29th ("Black Tuesday"). The 1929 crash brought the Roaring Twenties to a halt. As tentatively expressed by economic historian Charles P. Kindleberger, in 1929, there was no lender of last resort effectively present, which, if it had existed and been properly exercised, would have been key in shortening the business slowdown that normally follows financial crises. The crash instigated widespread and long-lasting consequences for the United States. Historians still debate whether or not the 1929 crash sparked the Great Depression or if it merely coincided with the bursting of a loose credit-inspired economic bubble. 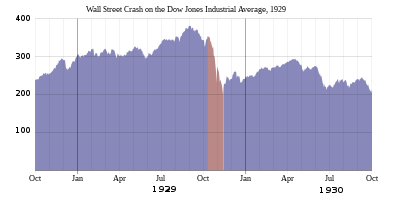 Only 16% of American households were invested in the stock market within the United States during the period leading up to this depression, suggesting that the crash carried somewhat less of a weight in causing it. The failure set off a worldwide run on US gold deposits (i.e. the dollar), and forced the Federal Reserve to raise interest rates into the slump. Some 4,000 banks and other lenders ultimately failed. Also, the uptick rule, which allowed short selling only when the last tick in a stock's price was positive, was implemented after the 1929 market crash to prevent short sellers from driving the price of a stock down in a bear raid. The stock market crash of October 1929 led directly to the Great Depression in Europe. When stocks plummeted on the New York Stock Exchange, the world noticed immediately. Although financial leaders in the United Kingdom, as in the United States, vastly underestimated the extent of the crisis that would ensue, it soon became clear that the world's economies were more interconnected than ever. The effects of the disruption to the global system of financing, trade, and production and the subsequent meltdown of the American economy were soon felt throughout Europe. 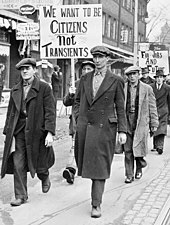 In 1930 and 1931, in particular, unemployed workers went on strike, demonstrated in public, and otherwise took direct action to call public attention to their plight. Within the UK, protests often focused on the so-called Means Test, which the government had instituted in 1931 to limit the amount of unemployment payments made to individuals and families. For working people, the Means Test seemed an intrusive and insensitive way to deal with the chronic and relentless deprivation caused by the economic crisis. The strikes were met forcefully, with police breaking up protests, arresting demonstrators, and charging them with crimes related to the violation of public order. There is ongoing debate among economists and historians as to what role the crash played in subsequent economic, social, and political events. The Economist argued in a 1998 article that the Depression did not start with the stock market crash, nor was it clear at the time of the crash that a depression was starting. They asked, "Can a very serious Stock Exchange collapse produce a serious setback to industry when industrial production is for the most part in a healthy and balanced condition?" They argued that there must be some setback, but there was not yet sufficient evidence to prove that it would be long or would necessarily produce a general industrial depression. 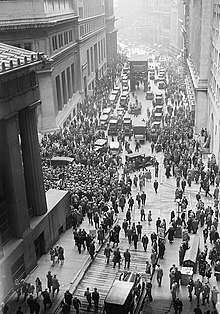 Some academics view the Wall Street Crash of 1929 as part of a historical process that was a part of the new theories of boom and bust. According to economists such as Joseph Schumpeter, Nikolai Kondratiev and Charles E. Mitchell, the crash was merely a historical event in the continuing process known as economic cycles. The impact of the crash was merely to increase the speed at which the cycle proceeded to its next level. Milton Friedman's A Monetary History of the United States, co-written with Anna Schwartz, advances the argument that what made the "great contraction" so severe was not the downturn in the business cycle, protectionism, or the 1929 stock market crash in themselves but the collapse of the banking system during three waves of panics from 1930 to 1933. ^ Bone, James. "The beginner's guide to stock markets". The Times. London. Archived from the original on May 25, 2010. Retrieved January 29, 2012. The most savage bear market of all time was the Wall Street Crash of 1929–1932, in which share prices fell by 89 per cent. ^ "Stock Market Crash of 1929". Encyclopædia Britannica. Retrieved January 29, 2012. ^ a b Dan Bryan. "The Great (Farm) Depression of the 1920s". American History USA. Retrieved November 10, 2013. ^ a b c d e f "Timeline: A selected Wall Street chronology". PBS. Archived from the original on September 23, 2008. Retrieved September 30, 2008. ^ Teach, Edward (May 1, 2007). "The Bright Side of Bubbles". CFO. Retrieved October 1, 2008. ^ "Market crash of 1929: Some facts of the economic downturn". Economic Times. Times Inernet. October 22, 2017. Retrieved February 16, 2019. ^ "Timeline". NYSE Euronext. NYSE. Archived from the original on June 11, 2010. Retrieved October 1, 2008. ^ a b Weeks, Linton. "History's Advice During A Panic? Don't Panic". NPR. Retrieved October 1, 2008. ^ "The Crash of 1929". PBS. Retrieved October 1, 2008. ^ "Dow Jones Industrial Average All-Time Largest One Day Gains and Losses". The Wall Street Journal. Retrieved May 11, 2011. ^ Perrin, Olivier (July 23, 2011). "LES GRANDS CHOCS DU XXE SIÈCLE (3) - En 1929, six jours de panique à Wall Street annoncent le pire, à venir" [THE MAJOR SHOCKS OF THE 20TH CENTURY (3) - In 1929, six days of panic on Wall Street announce the worst, to come] (in French) (3) (Le Temps SA ed.). Geneva: Le Temps. ISSN 1423-3967. OCLC 38739976. Archived from the original on February 25, 2019. Retrieved February 25, 2019. ^ "The End of Optimism? The Great Depression in Europe". Digital History Reader. Retrieved January 10, 2019. ^ Selective Service System. (May 27, 2003). Induction Statistics. In Inductions (by year) from World War I Through the End of the Draft (1973). Retrieved September 8, 2013. ^ a b Hyman, Louis (December 16, 2011). "How Did World War II End the Great Depression? : Echoes". Bloomberg. Retrieved August 25, 2015. ^ Shann, Edward (November 1, 1929). "Broad Facts of, USA Crisis". The Daily News. Perth, Western Australia. p. 6 (Edition: Home Final Edition). Retrieved November 22, 2012 – via National Library of Australia. ^ Lambert, Richard (July 19, 2008). "Crashes, Bangs & Wallops". Financial Times. Retrieved September 30, 2008. At the turn of the 20th century stock market speculation was restricted to professionals, but the 1920s saw millions of 'ordinary Americans' investing in the New York Stock Exchange. By August 1929, brokers had lent small investors more than two-thirds of the face value of the stocks they were buying on margin – more than $8.5bn was out on loan. ^ Facing the facts: an economic diagnosis. Retrieved September 30, 2008. ^ Shiller, Robert (March 17, 2005). "Irrational Exuberance, Second Edition". Princeton University Press. Retrieved February 3, 2007. ^ Galbraith, John Kenneth (1954). "In Goldman Sachs We Trust". The Great Crash, 1929. Boston: Houghton Mifflin. ISBN 0-395-85999-9. , cited in Taibbi, Matt (April 5, 2010). "The great American bubble machine". Rolling Stone. Retrieved November 3, 2017. ^ "Grain Plunges". The Courier-Mail. Brisbane, Qld: National Library of Australia. October 26, 1929. p. 19. Retrieved November 22, 2012. ^ "Wild Selling. New York Panic". The Sydney Morning Herald. Sydney, NSW: National Library of Australia. October 26, 1929. p. 17. Retrieved November 22, 2012. ^ "Second Crash". The Sydney Morning Herald. Sydney, NSW: National Library of Australia. October 30, 1929. p. 17. Retrieved November 20, 2012. ^ Scardino, Albert (October 21, 1987). "The Market Turmoil: Past lessons, present advice; Did '29 Crash Spark The Depression?". The New York Times. ^ a b "Digital History Reader – European History – Module 04: The End of Optimism? The Great Depression in Europe". Virginia Tech. Retrieved November 4, 2016. Bierman, Harold (March 26, 2008). Whaples, Robert (ed.). "The 1929 Stock Market Crash". EH.Net Encyclopedia. Santa Clara, California: Economic History Association. Retrieved February 2, 2017.